Keywords: Nanoparticles, Chemotherapy, Prostate cancer, Drug delivery, Targeting strategies, ERP effect. Keywords:Nanoparticles, Chemotherapy, Prostate cancer, Drug delivery, Targeting strategies, ERP effect. Abstract:Traditional prostate cancer therapy and especially chemotherapy has faced many challenges. Low accumulation levels, rapid clearance or drug resistance at the tumor site have been central to why the effect of chemotherapy drugs has declined. Applications of nanotechnology to biomedicine have enabled the development of nanoparticle therapeutic carriers suited for the delivery of chemotherapeutics in cancer therapy. This review describes the current nature of nanoparticle therapeutic carriers for prostate cancer. It describes typical nanocarriers commonly used for the delivery of chemotherapy or for imaging examination. Targeting strategies and related influencing factors are investigated to find ways of enhancing treatment effects of nanoparticles. 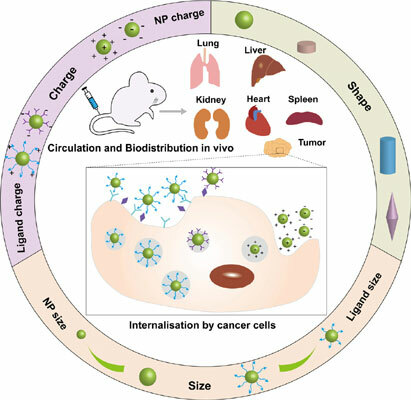 The overall purpose of this review is to further understanding and to offer recommendations on the design and development of therapeutic nanoparticles for prostate cancer.